During 1940 the College transferred most of its activities from its Central London headquarters in Red Lion Square to Wembley. Then, following the intense bombing of London which had started on 7th September, Council decided at its October meeting that "it was desirable to remove the offices … further away from London" and premises were rented in Harrogate. However, throughout this time, the Library remained in Red Lion Square and continued to provide its regular services. It was only the bombing of the Red Lion Square building in the final month of the Blitz which finally forced the relocation of the books to Harrogate and the eventual suspension of the Library Service in 1942. "On Saturday night, 10 May 1941, the long night of the great air raid on London, one of the buildings in Red Lion Square was hit and caught fire…..Books do not burn easily, but they hate getting wet, so the fire hoses did more damage than the fire..... I went around on the Sunday morning to see if I still had a library. Returning in 1945 "to the charred remains of the Library in Red Lion Square’ Miss Raymer recalls how she used the devastation as an excuse ‘to get rid of quite few out of date items which people had donated, putting them down to being lost in the Blitz!" 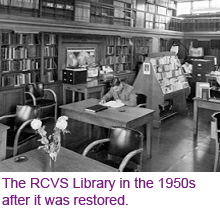 The RCVS annual report of 1945/46 records that "although the Library has now been repaired, the restoration to its original order will take a considerable time … [it is] a formidable task." 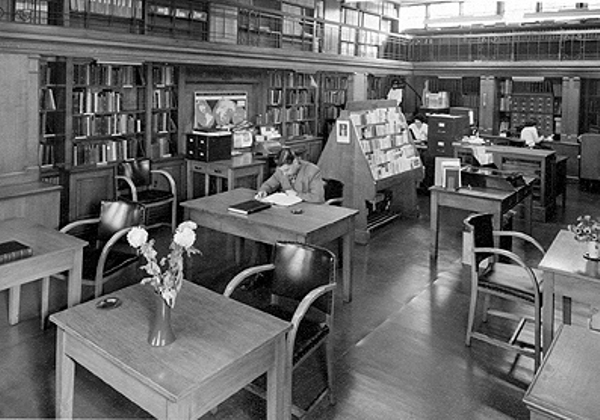 The full Library service finally resumed in 1947 but it was not until 1953 that Miss Raymer was able to put in place the repair and rebinding of the damaged material under a scheme funded by the War Damage Commission. The binding chosen was a very high quality shiny red Morocco binding – which means that you can easily spot the material that survived the Blitz in today’s Historical Collection. Click on the photograph above to view an enlarged version.